Well, besides that, how was the play, Mrs. Lincoln? 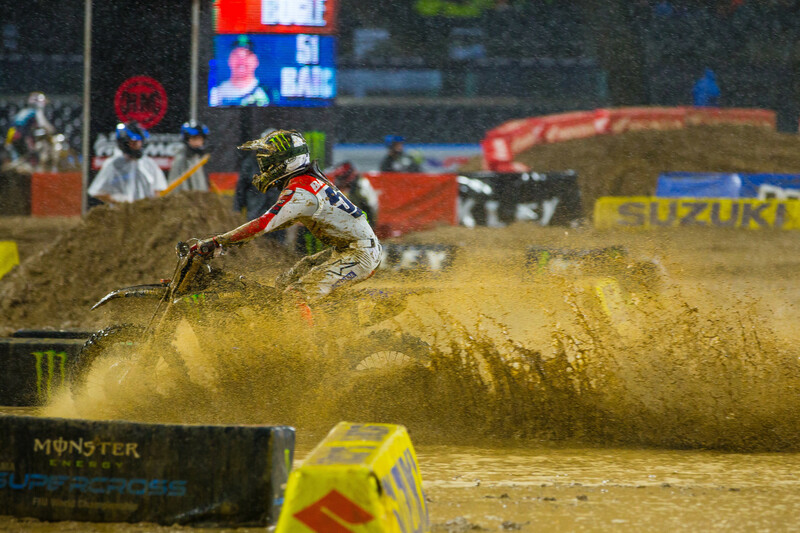 I’ve been thinking that old adage all week in regards to the muddy, brutal, and mysterious San Diego Supercross, where the weather gods toyed with the promoters and track crew and left them with some tough decisions to process and make—and in a hurry. We can all armchair quarterback what should have been done with the racetrack and the tarps in the days and hours that led up to the actual rain, and we can castigate the decision to add a drying component to a few of the wetter sections. And we can assure one another that it will never happen again, given the week of burning selfies and recriminations and apologies that have followed. What we can’t do is put ourselves in the guy’s shoes who, with all best intentions, decided to liberally add lime to the track surface in hopes that it would help dry out the drowned out racing surface. But instead of solidifying the track, it apparently turned it into some kind of toxic brew. No one really knew until the damage was done, and now Feld Entertainment is having that proverbial week in the barrel. They have been trying to assess and rectify the damage done from the inadvertent chemlab experiment gone wrong. And, moving forward, they have their work cut out for them. Organizing big, live motorsports events in stadiums and airing them all over the world, oftentimes in unpredictable weather, is no easy task. My dad tried and failed twice in Pittsburgh’s old Three Rivers Stadium, both times the victim of weather. Youthstream tried and failed a few times too. So did the X Games folks. But Feld (and all of its previous incarnations) has been doing it since 1972. They do it right, and rarely do they get things completely wrong—and never as wrong as San Diego. But it wasn’t a systematic failure like, say, the night the lights went out in Las Vegas in 1995, but rather one of planning and execution under a cloud of, well, gathering clouds. Like winter in Game Of Thrones, everyone knew the storm was coming. What they didn’t know was the severity of it, and what it would do to the stadium floor. So someone, somewhere down on the track, threw out what was apparently lime in the worst spots, perhaps not realizing that, like oil and water, it wasn’t going sink into the standing puddles and absorb the moisture. Instead, it formed a witch’s brew of skin-burning, aluminum-scarring, seal-eating blackwater, and no one realized the nasty effect it would have on bodies and bikes until the checkered flag had mercifully fallen on the gathering. It was like being stationed on the Western Front out there for the infield crew, flaggers, and officials; for the riders, it was splashing across No Man’s Land. What happened next was a lesson in new media. The riders, unprompted and unorganized, began posting selfies of the rashes and abrasions that started popping up soon after the race. It was an organic uprising of sorts, a series of complaints and WTFs that went viral in a hurry. That’s how athletes—and really anyone—use their voices now, and the bigger the star, the further the reach. And because the globally popular Ken Roczen was one of the riders most affected, his 1.2 million followers were livid—and they had a right to be. Everyone else’s followers did too. 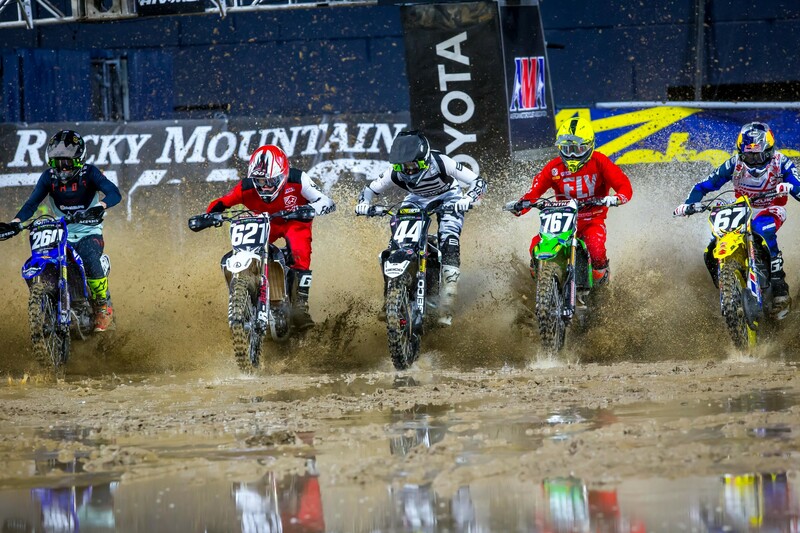 Just like that notorious night in 1995 when the lights went out in Sam Boyd Stadium in Las Vegas and half the stars walked, change came quickly to supercross. The powers that be (Gary Becker and Charlie Mancuso) knew they had work to do to regain the trust and confidence and cooperation of the athletes and the teams, and they went to work and got it back. I know Feld is trying to do a make-good, and maybe even more. Because not only do they have to deal with the riders and race teams, they probably have some issues with the city and county on the near horizon. It’s the nature of doing business in this space—and in a state that doesn’t take too kindly to issues related to the land and the sea. It was a small mistake that turned into a massive crisis, and I hope Monster Energy AMA Supercross gets through it with some lessons learned and chances to continue to make good. It was human error in a Mother Nature moment. I just mentioned the best that can happen. The worst is having to jump through hoops with civic leaders and local authorities to ever race downtown San Diego again, which will do even more damage than a big bag of lime in a puddle of mud. Let’s hope everyone can get past this and enjoy what’s still a close and exciting and very entertaining season. Now, out of the frying pan and into the icebox. When I started my drive to Pittsburgh International Airport in the pre-dawn hours of this morning, Morgantown, West Virginia, was a downright chilly 35 degrees. Then I checked my phone for Minneapolis. It was -10 degrees. Ugh. Can’t remember back-to-back weekends with such harsh weather, but at least there’s a roof on this one, and the championship is still very, very close—eight points separate Tomac, Webb, Musquin, and Roczen—and the 250SX East starts anew. Let’s hope this weekend goes off without a hitch, and we maybe even see a fifth winner in six rounds. Speaking of the 250SX East, Jason Weigandt, Steve Matthes, and Jason Thomas all weighed in with their predictions here and on the Racer X Podcast this week. Chase Stallo also put a team guide together, which you can read here, and discussed it here. It should be a stacked series with Forkner, Davalos, Sexton, Craig, A-Mart, Cooper, Smith, and others battling for the title. Weege is at press day as we speak and will have more tomorrow. Let’s get into the rest of the week. It’s nice to get an indoor race to help us escape from -2 degree temperatures outside this stadium, but the weather did jack a few teams for today’s press day. Rockstar Energy Husqvarna’s rigs were late getting here, so Dean Wilson, Thomas Covington, and Jordan Bailey had to watch press but didn’t get to ride. The team was scrambling to get the freezing bikes ready but ran out of time. Also, Monster Energy/Yamalube/Star Racing Yamaha had rig problems and had to get someone else to bring their bikes to the stadium. Feld offered up an extra riding session so Justin Cooper and Mitch Oldenburg could get in a few laps after their bikes finally showed up. A week ago, Christian Craig thought he wouldn’t be able to race here due to his thumb injury. He’s been trying every therapy solution possible, and finally on Wednesday got back on a supercross track and decided he was good enough to race. He’s just out to get points. Chase Sexton was planning on racing 250SX East all along, until Craig got hurt, which moved him West. Then Sexton suffered an injury of his own to his collarbone, which forced him back to the East Region. He says the injury was minor, and he doesn’t think it cost him anything in terms of prep time for this race. Also, somewhere along the way, Sexton has gotten way taller than I remember him. You forget how young these guys are sometimes. Still growing! Justin Cooper is indeed flying at the test track. But he’s only ridden one supercross, ever, Anaheim 1 last year, so he’s trying to mix rookie expectations with wanting to get good starts and run up front. 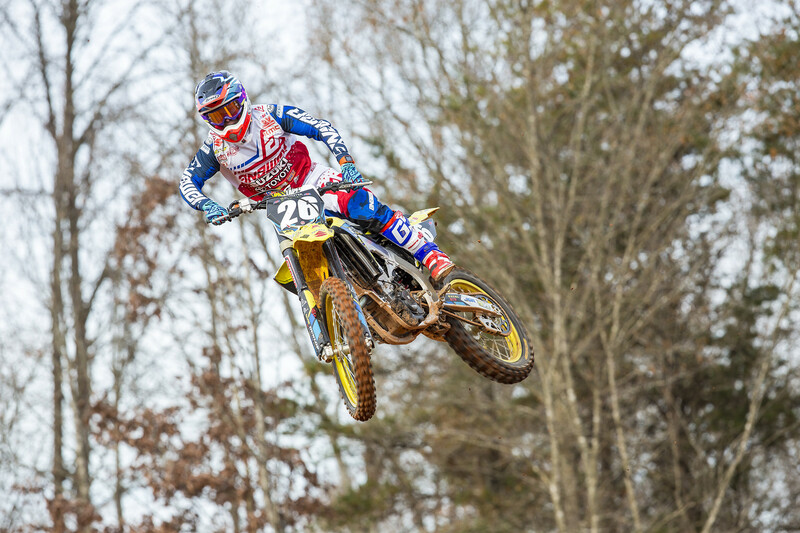 Thomas Covington admitted that supercross has been a major learning curve. The whoops have been the hardest part, as well as setting up his bike. He has zero idea what to expect tomorrow and said for now, he’ll just be happy making the main event! Jordon Smith is in a good position coming into the season. He said in 2017 he was new to the bike and team, and as he learned they got better as the season went on. Last year, he missed a lot of pre-season time due to an injury suffered at Red Bull Straight Rhythm, so he wasn’t totally ready to go by round 1 of 2018. He says the final race in Vegas last year was actually the best he felt. This off-season has been smooth, and he’s healthy and ready right now. Alex Martin would like to tell all of his home fans here in Minnesota that he just wants to get some racing under his belt. As much as he’d like to light it up for the crowd, he has missed a lot of supercross the last few years with injuries, so he just wants to build from here. Kyle Peters is going to walk from the truck to the stadium this year. He will not ride his bike through the snow because last year he crashed in the pits (on ice) and tore his ACL. Of course, you all want to know more about the lime situation from last week in San Diego. I believe the media will get some time to ask questions tomorrow, so stay tuned. In the meantime, I did hear that no lime will be used in this weekend’s track build. The dirt looks pretty good anyway, right now, but you’d have to figure some of it is frozen or wet and might be soft. 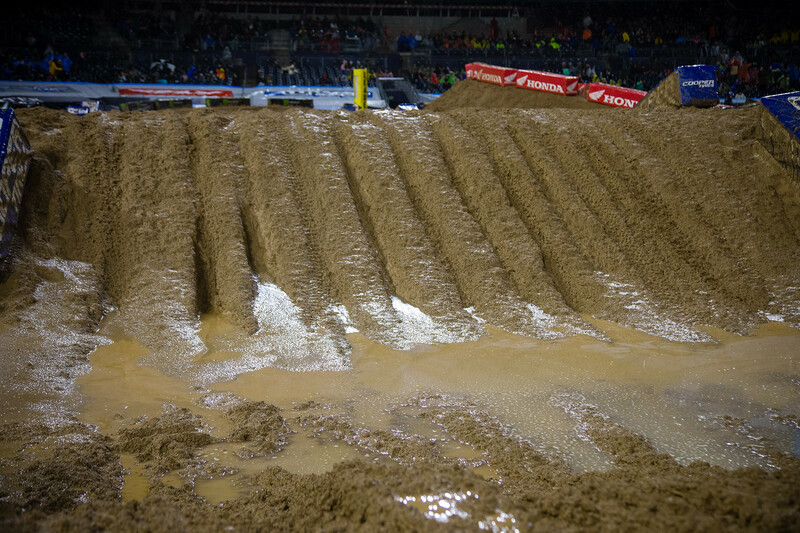 Expect to see some ruts tomorrow night. It’s been a week since our friends at TransWorld Motocross went on “pause.” In that time, the team has started publishing swapmotolive.com as a home for content. We reached out to Michael Antonovich, the online editor for TransWorld Motocross and Swap Moto Live for an update. Newport Beach, California's Robert Haag actually has two lines in The Vault. 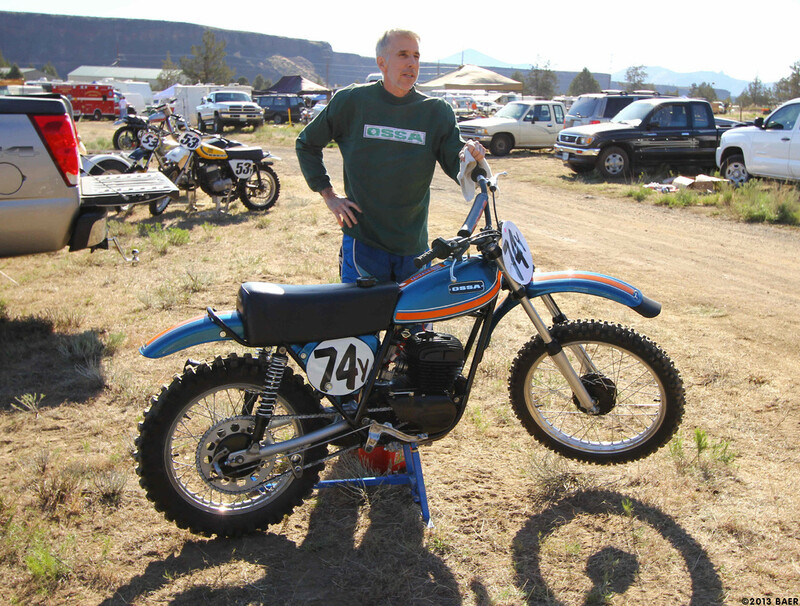 His first is from the very first 125 National at Hangtown in 1974—he finished third on a Husqvarna, beaten only by the factory Honda 125 Elsinores of Marty Smith (an eleventh-grader at the time from San Diego) and Chuck Bowers. Then Haag, who was 17 at the time, disappears for four years and shows up again at Hangtown in 1978, where he finished 24th in the 250 class. According to Cycle News, Haag had actually retired the previous year, then decided to get back into moto and started riding again in December '73. He felt like he was back up to his old speed by Hangtown, and his 8-7-4 finishes over the three motos gave him third overall. But that was the only AMA National he did in that first year of the 125 class. I did find a story written by Haag about his early years of racing, when Husqvarna took him under their wing for the '72 Inter-Am Series, but because he was still only 15, he could only ride amateur-day races. We also found Haag on Facebook, and it looks like he's into Vintage MX, so if we hear back, maybe we'll know what ever happened to his very, very short career! Yoko was a promising and innovative Finnish MX brand that a man named Juha Tirinen founded toward the end of his own motocross career. At first he called it Joko, and he was one of the first to make nylon motocross pants, replacing the actual leather ones (and that's the reason old-schoolers still call their race pants "leathers"). Juha became friends with Geoff Fox of Moto-X Fox and began making race gloves for his team riders, as at the time, Mr. Fox was backing top American privateers like Pat Richter, Jim Turner, and a young Mark Barnett. Mr. Fox was the man who told Tirinen that Joko would maybe translate better in America if he used a Y instead of a J, as the J is supposed to sound like a Y in Finnish language but sounds like a "joke" here. So Joko became Yoko. (According to Yoko's website, Tirinen would later suggest that Geoff replace the letter O in "Fox" with the Fox-head symbol that has become iconic in global motocross and beyond.) 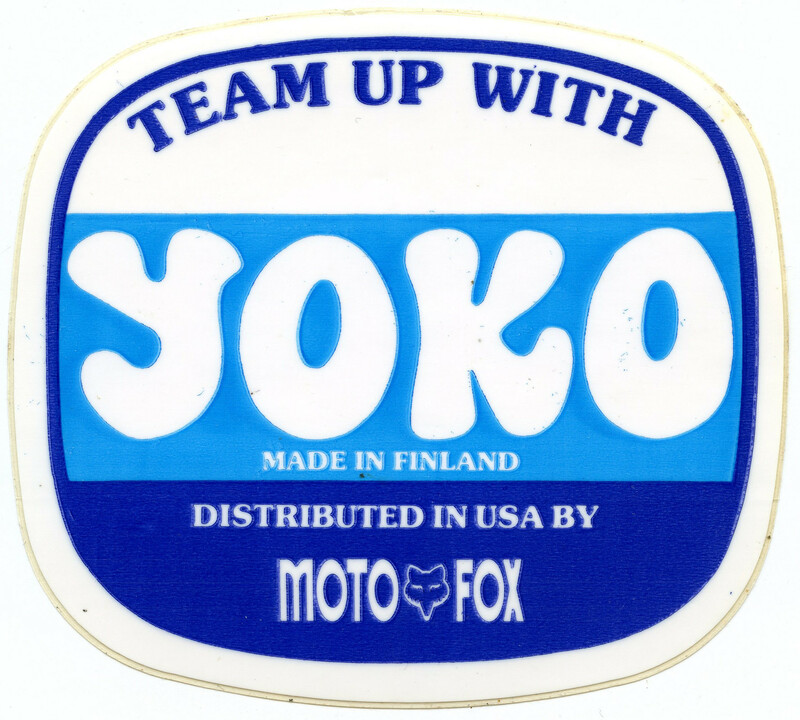 It wasn’t until 1982 that Yoko and Fox started selling their gear separately, though Fox gear was produced by the Yoko in Finland until the early 1990s, along with O’Neal, AXO, Answer, and more. Yoko would grow from there, to the point where they had some top Grand Prix racers in FIM World Champions Hakan Carlqvist, Heinz Kinigadner, Michele Rinaldi, Andre Malherbe, David Thorpe, John Van den Berk, and more. 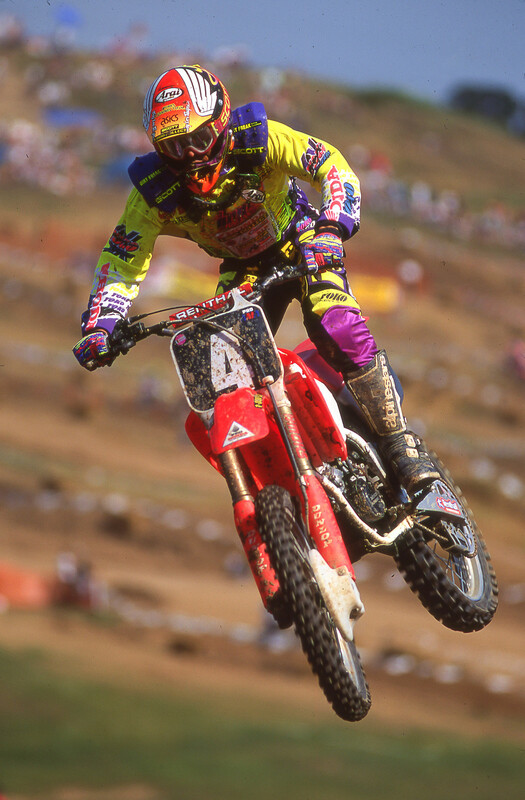 Among AMA riders who wore Yoko were Steve Lamson, Tallon Vohland, and Rodney Smith. But then Yoko got out of the motocross gear business in the late nineties, allowing another Finnish brand to take over their license. Yoko got the license back in 2016, and now they are making another big push. This week, Yoko announced that they would be the official gear supplier of the Rockstar Energy Husqvarna Factory Racing MXGP team, which include 2017 MX2 World Champion Pauls Jonass. Welcome back, Yoko! Just as he goes on break for the 250SX East Region, Monster Energy/Pro Circuit Kawasaki’s Adam Cianciarulo has moved up again on the all-time 125/250 SX wins list. Thanks to winning in San Diego, the 23-year-old rider became the 20th supercrosser in the history of this class, in existence since 1985, to get at least nine wins. But Cianciarulo has a special feature: all of the others were at some point series champions, and AC92 has yet to win one, though he is leading the West Region right now and will sport its red plate when he races again at the Atlanta East-West round early next month. Cianciarulo's nine wins overtakes the eight of Dean Wilson as the standard for most wins without a title in this category. With five rounds in the books, there are two things we know for sure: there will be a new champion and it will be his first AMA Supercross title. Jason Anderson is out and on the mend after surgery on his broken arm, leaving a scramble for his crown. There have been four race winners in five rounds, as well as four different points leaders: Justin Barcia, Ken Roczen, Cooper Webb, and now Eli Tomac. This is the 11th season in championship history in which we've seen four different winners so early. And of those first ten times, only in 1985 was the eventual champion not among the four winners—though this time the Honda's Roczen and Red Bull KTM's Marvin Musquin are definitive title contenders who have yet to win in 2019. 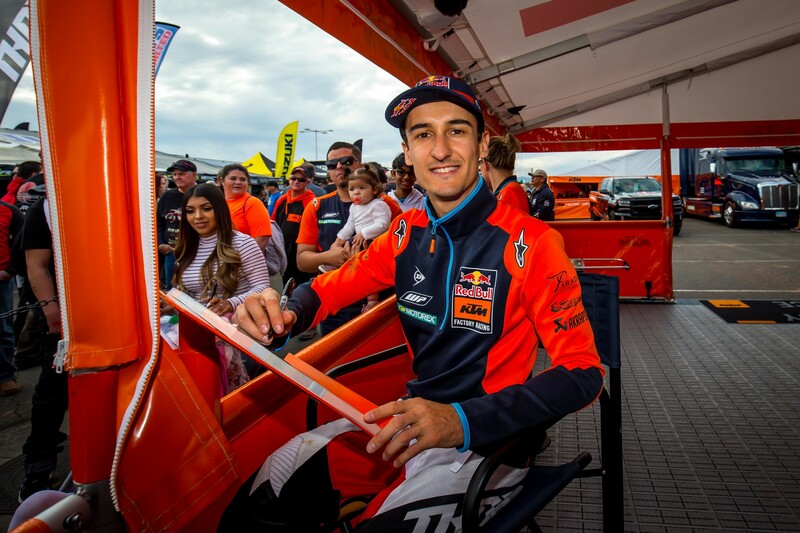 For Red Bull KTM’s Marvin Musquin, the #30 is an important one in 2019. This December, the French rider will turn 30, while last Saturday night in San Diego he got his 30th podium in the 450SX class. Musquin became only the fifth international supercrosser to take at least 30 podiums in the premier class. The record-holder is Chad Reed from Australia, who is also the absolute record-holder in the history of the AMA Supercross with 131 podiums in all. 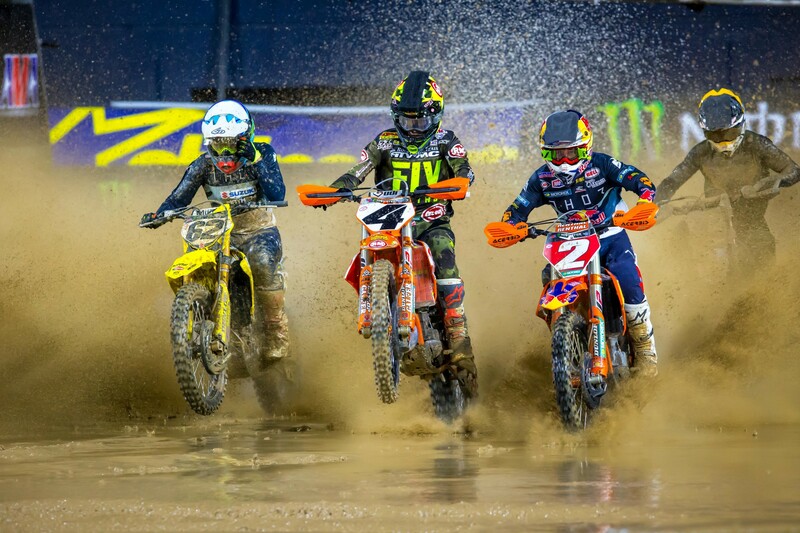 Musquin, the two-time MX2 World Champion and the 2015 250SX East Region Champion, debuted in 450SX in 2012, racing four rounds without any podiums on the KTM 350. Marv Attack has raced 450SX full-time since 2016, all in the saddle of a KTM 450. The injured Jeffrey Herlings commented again this week on his 2019 MXGP title defense, which is up in the air right now, depending on how long it takes his smashed foot to heal. In another report over in Europe, Herlings admitted to fanning the flames with hints that he might be considering the U.S. if he misses too many of the early MXGP rounds, as he will miss the opener in Argentina for sure. Beyond that, it's a matter of wait-and-see. Herlings' options may change if he misses the second MXGP round in Great Britain, three weeks after the Argentinian opener, but here's hoping he is able to line up by then. 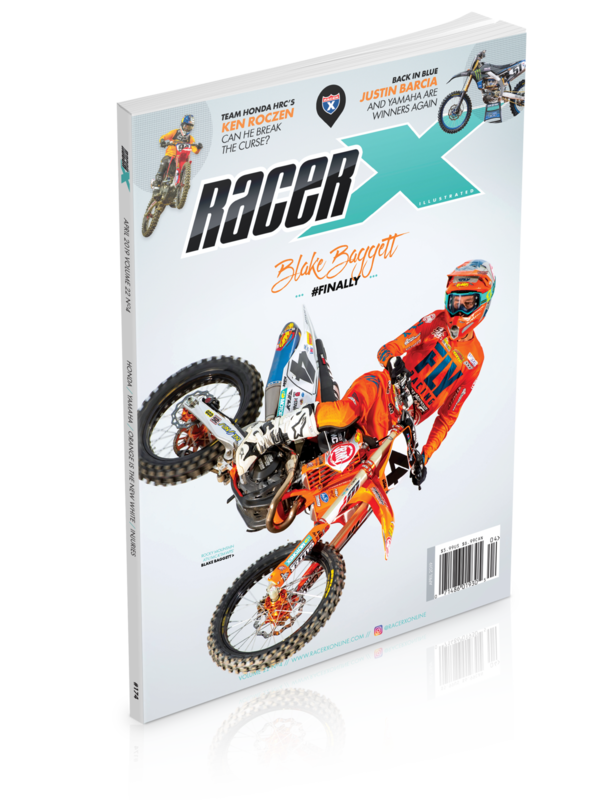 The April 2019 issue of Racer X Illustrated just landed on our desks with Blake Baggett on the cover. The issue has some very interesting stories in it, including one Blake Wharton wrote on the history of Suzuki's amateur support program, which began with the 1977 release of the Suzuki RM80, when the company's work with the Dickinson family of R&D Racing began. You might recognize some of the names that followed: Brian Myerscough, Scott Burnworth, George Holland, Larry Brooks, Mike Healey, Buddy Antunez, Jeff Dement, Charley Bogard, Ezra Lusk, Travis Pastrana, Davi Millsaps, Broc Hepler, Ryan Dungey, Eli Tomac, Jason Anderson.... There's also a story about Yamaha getting its factory team back up and running, Honda trying to break the 450 title curse that goes back to Ricky Carmichael's departure, and how KTM and Husqvarna live and work together under separate orange and white tents. There's also a Garage Rebuild of a Jeff Stanton-replica 1992 Honda CR250R and a 10 Minutes w/ Jacob Hayes. And there's also a feature that Jason Weigandt and I collaborated on about the strange phenomenon in SX/MX of riders trying to hide injuries in the open age of the internet, social media, and the whole prospect of a 24-hour news cycle. It's called "Too Close for Comfort," and it's pretty timely right now. 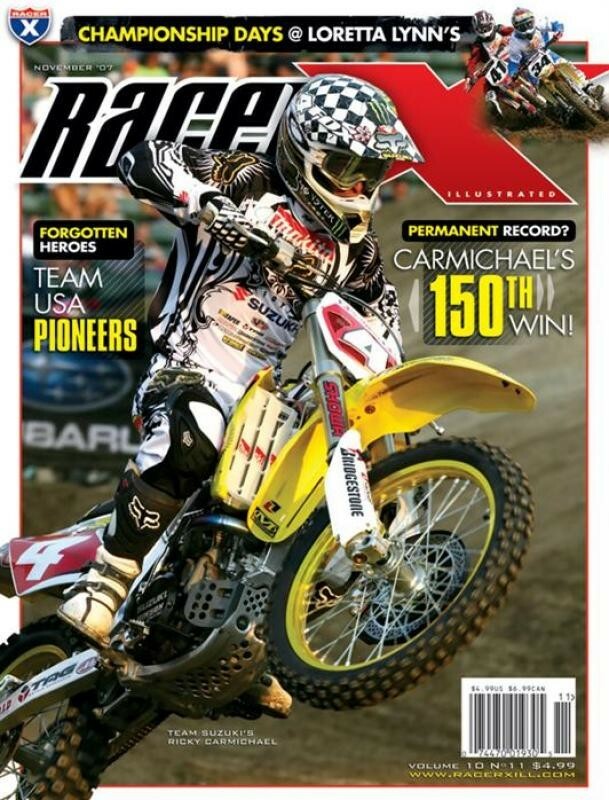 And with Baggett getting the cover on the #4 Rocky Mountain ATV/MC-KTM-WPS 450, it got us wondering when exactly was the last time we ran a standalone cover with a rider wearing #4, since it's been since the March 3, 2007 St. Louis SX that a rider wearing #4 had won a round of Monster Energy AMA Supercross before Baggett's January 12, 2019, Glendale win. For the last five years, Eli Tomac has been one of the most consistent supercrossers in the 450SX championship regarding podiums and wins. Besides Ken Roczen and Jason Anderson, Tomac is only the third rider to get podiums every season since 2015. But Tomac is the only one of the three to win a 450SX main event in every season since 2015. By winning in San Diego last Saturday, Monster Energy Kawasaki’s Tomac became the 12th rider of all time to win in at least five consecutive seasons in the premier class. The record-holder is James Stewart, who won in 10 consecutive years. Of the 12 riders to win in at least five consecutive seasons, only one—Mike LaRocco—did not win an AMA Supercross title during his career. For the latest from Canada, check out DMX Frid'Eh Update #6. How about this blast from the past? 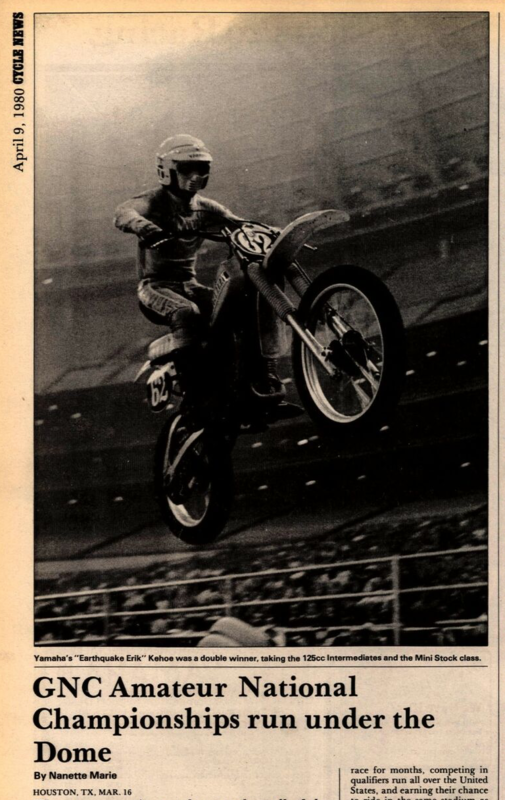 That's current Honda HRC factory team manager Erik Kehoe, airing out his Yamaha YZ125 in the 1980 GNC Amateur Supercross in the Houston Astrodome, spotted in the Cycle News Archives. Subscribe or Renew Now and Get a FREE Scosche Portable Backup BatteryNo need to worry about your phone dying at the track. 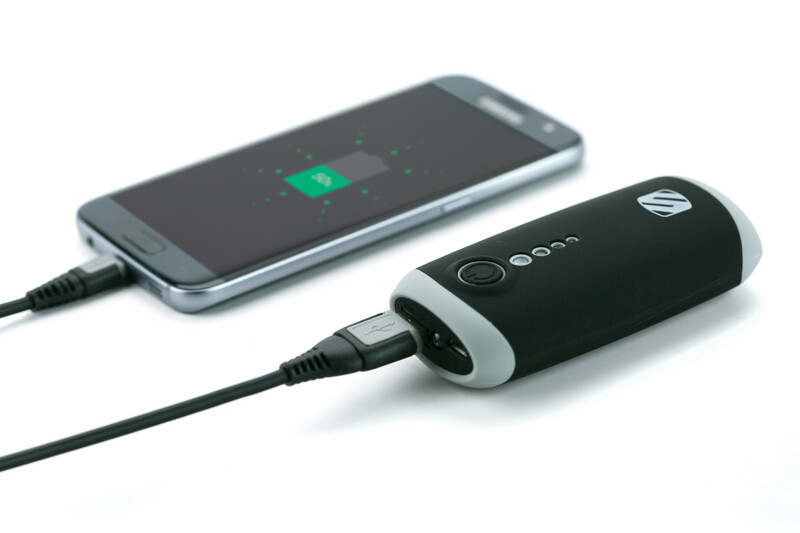 Subscribe now for as low as $9.98 and get your FREE Scosche Portable Backup Battery for this upcoming year.